What comes to your mind when you think of graffiti? Unfortunately, treatment what comes to mind for many is something negative—vandalism, tagging, crime, drugs. But there is a flip side to graffiti—beautiful, powerful, eye-popping works of art created by a growing segment of professional artists that use spray paint as their medium of choice. There are many people who call themselves graffiti artists—people who grab a few cans of Krylon and head to the nearest dark alley. 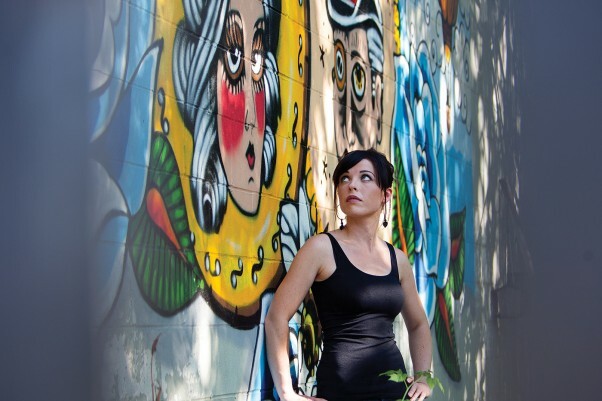 Then there are people like Gillian Brooks who take the medium seriously, and who strive to make graffiti art recognized for what it is—an up and coming art form that should be respected. Brooks does so by creating beautiful murals that are full of vibrant color and positive imagery, and she’s doing so right here in the Comox Valley. Brooks calls herself a muralist/spray paint artist—and since she’s a woman, she’s quite a rare breed. “I don’t know of any women here on the Island who do what I do,” she says. “I do know of a couple of female spray paint muralists in Vancouver, but all in all, the female graffiti artist is not common.” In fact, according to Brooks, graffiti artistry is mainly a man’s world. Brooks likens female graffiti artists to female break dancers or female tattoo artists—they exist, but they’re few and far between. Brooks got involved with graffiti art when she was 17. She attended an art program for high school students called Bealart out of London, Ontario, her hometown. At the program she met many aspiring artists from various backgrounds who specialized in different forms of art. Particularly, Brooks was drawn to some boys who specialized in creating works with spray paint. Specifically, graffiti art is a creative genre that uses spray paint and large surfaces. According to Brooks, spray paint is quite diverse as an artistic medium. “Spray paint can be used to create images that are extremely realistic or images that are just bold, bright and fun,” she says. The paint Brooks uses isn’t the kind you would purchase at the hardware store. “That wouldn’t work for the type of art I do,” explains Brooks. Instead, she uses paint that is formulated specifically to be used by professional artists. Since Brooks can’t buy such paints here in Canada, she orders all her paints from a supplier in California. “All the colors are pre-mixed, so I just choose the colors I’m attracted to. The manufacturer comes up with new colors every year and they always have fun names attached to them. Actually, it’s a lot like choosing eye shadow,” says Brooks with a laugh. She should know—she is also a make-up artist. To create her work, Brooks takes caps or nozzles of varying sizes and attaches them to the cans of paint. The different nozzle sizes give Brooks more control over the thickness of the lines created from the sprayer. Brooks’ style of art is influenced by many things, but mainly she is inspired by images that some people would describe as retro. “More than anything, I’m inspired by things that are vintage,” she says. Tattoo flash, Brooks’ major inspiration, comes from the old tattoo designs that would line the walls of tattoo parlors in the 1930s, 40s and 50s. Sailors would go from port to port, and they’d often get a tattoo as a souvenir of the places they’d been. Remember Popeye and his tattoo of the anchor on his arm? Tattoo flash designs were created in such a way to be quickly done, so the tattoo artist could create more tattoos in a short amount of time. Over the years the sailors travelled around showing off their tattoos, the images began to repeat, and certain images became very popular. Eventually they became iconic. Roses, swallows, pin-up girls, tigers, anchors, scrolls and skulls are synonymous with flash tattoo. Brooks uses many flash tattoo icons in her artwork, but her favorites are roses and swallows. She also likes to adorn her art with what she calls “ladies” and “gentlemen”—vintage looking characters complete with ribbons and pin curls, or top hats and monocles. It’s a design that is positive, upbeat and unique to Brooks—a design that can be relatable to kids and adults alike. Flash tattoo art also has bold, thick lines to withstand years of wear. As Brooks explains it, these images mesh well with graffiti art, which uses a formula of solid lines and bright colors. Though it may sound like a simple formula, Brooks says it has taken her years of practice to get it right. Cumberland is also the location of Brooks first mural on the Island. “It all started when my friends moved into a house that was right next to a partially completed mural,” says Brooks. “It had stood like that for years. The wall was gloomy and dark, and it just screamed to be painted.” The couple suggested that Brooks paint the wall to brighten it up—so she did. It took six long days, but Brooks turned the area into what she calls a secret garden. “People walk by and see the mural, and it makes them smile,” she says. Lastly, Brooks has been asked to paint the side of the Corre Alice art gallery with a fresh and exciting mural that incorporates her favorite images—swallows and roses. Yeah Gillian! This captures your work and your essence so well! Congratulations!